Neo-synthesized capsid are held in the cytoplasm until maturation (Gerelsaikhan et al. 1996 ) Rating=2. The core protein C-terminus is intrinsically disordered and placed on the borders of holes in the nucleocapsid. On immature particles, the core C-terminus would be oriented toward the interior of the capsid (Chen et al. ) Rating=1. The capsid matures after reverse-transcription of the pgRNA into rcDNA. During that process, nucleotides diffuses freely into and out of the capsid shell because the capsid id fenestrated. The reverse transcription induces a capsid conformational change, rendering it competent to budding/exit or amplification. For DHBV, dephosphorylation of core c-terminus on mature particles would enable the virion to either exit the cell or go into the nucleus (Perlman et al. 2005 ) Rating=2 (Basagoudanavar et al. 2007 ) Rating=2. On mature particles, the core C-terminus is exposed to the exterior for half of the chains, exposing the NLS signals. 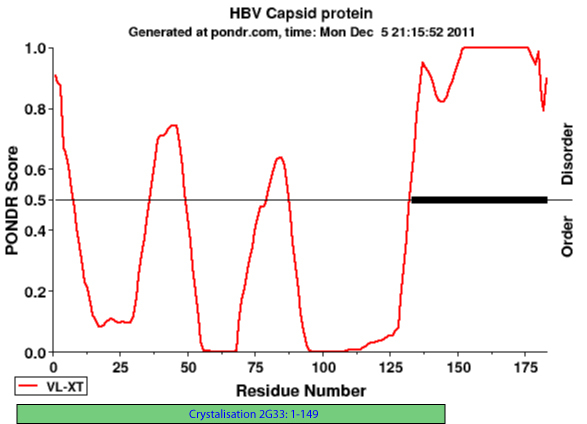 For the other half of capsid proteins, the C-terminus would be exposed to the interior and bound to the viral genome. (Lieder Thesis 2002, referred in Bruss 2004 review)(Meng et al. 2011 )Rating=1.